Guilty as charged - like most everyone else in the neobistrot Les Enfants Rouges last Friday evening - Co. and I ended up there because of a one paragraph mention in an article titled 'France's New Wave of Chefs' that appeared in the March 29-30, 2014 edition of the International New York Times. 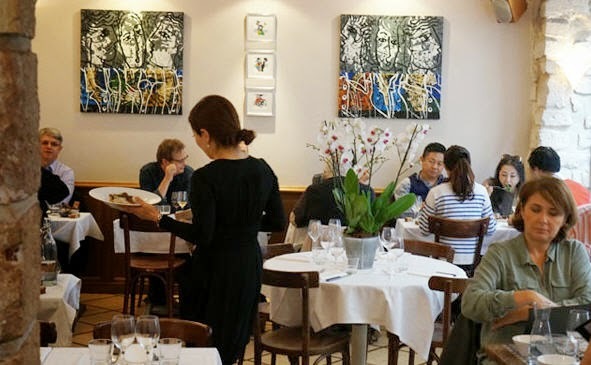 In this article, author/journalist Michael Steinberger makes the claim that it is foreign chefs who are the ones breaking new ground in the French restaurant scene, and buttresses his argument by highlighting four venues that "for the first time in a long time' is bringing French cuisine back to life. 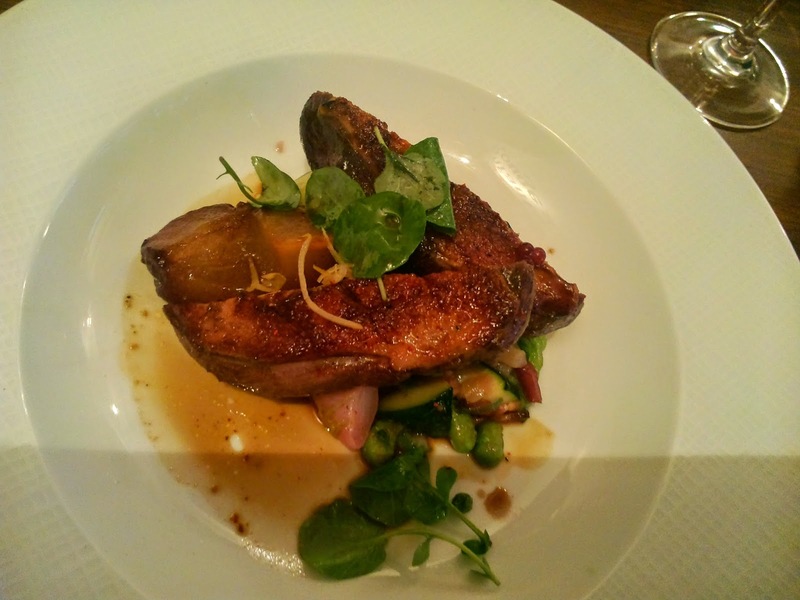 I've already reviewed two of them here - Bones (which I liked, but Co. didn't) and Roseval (which we both agreed was way over-rated, and the arrogant, impolite staff didn't help matters). A third, Albion, didn't look so hot when I checked out online descriptions and reviews. The fourth did - the aforementioned Les Enfants Rouges - the focal venue for this installment. Here's what I think of Michael Steinberger - they shouldn't let him out of the Bronx (or wherever the hell he resides in the Big Apple). I get it - you're a journalist, you have to come up with a catchy theme, so find a few new interesting bistrots in Paris with foreign chefs and, viola, you've got a theme. 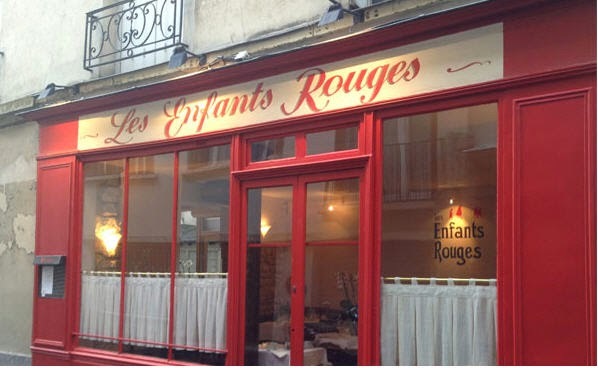 Passing through the quaint Les Enfants Rouges market, with its food stands and quaint shops, we came upon the similarly named restaurant where I had reserved earlier in the week. The name, by the way, has nothing to do with Chinese kids; rather, it's the name of an orphanage that used to exist in the area, where the children were clad in red clothing. Les Enfants is another one of those small, storefront restaurants that are so common in Paris - even though we snagged a good little table off to the side, once the place filled up and the tables that ours sat between welcomed patrons in their chairs, we felt the big squeeze, and I was jabbed in the shoulder more than once by the guy sitting at the table behind me. Both of these dishes were good, but not very memorable. You know me, I'm not a big fan of pear, and I would have liked to have been asked how I wanted my canette prepared - it would have been rarer than this. 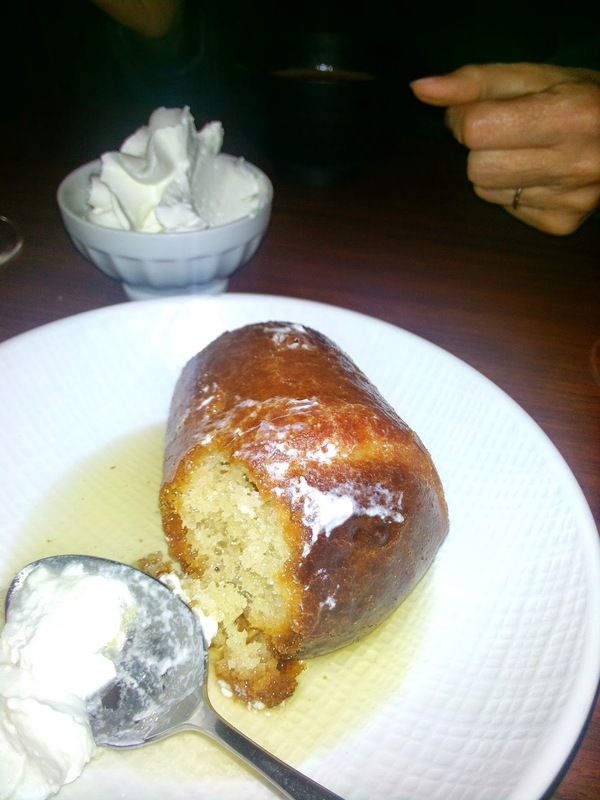 Desserts time - I ordered Les Enfant's much praised baba au rhum and Co. opted for the panacotta with chocolate and mint. Both hit the spot - I could tell Co. liked her mousse-like panacotta because by the time I got around to asking her for a taste, it was gone. 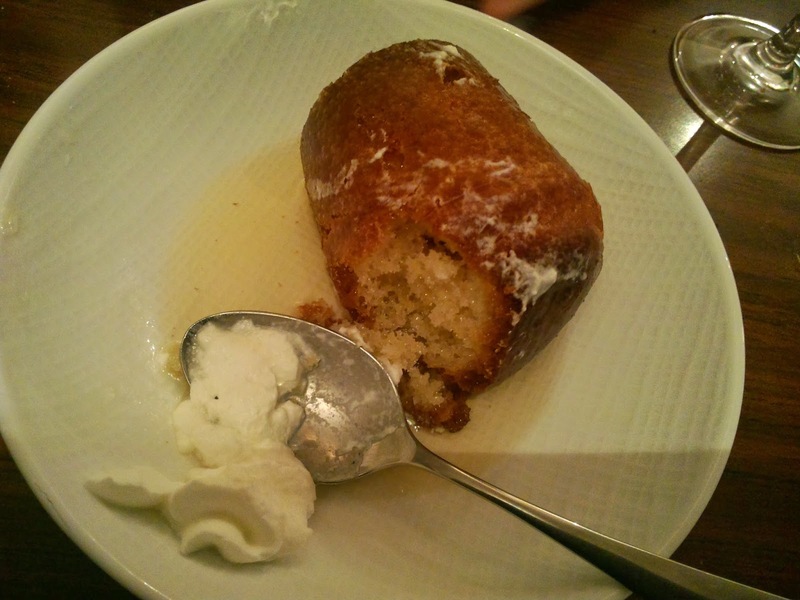 My baba au rhum was delicate and moist - better than the one at Buerre Noisette? Probably not, although Les Enfants would be in the running if, like Buerre Noisette, they would leave the bottle of rum on the table. I am happy/sad for Les Enfants. 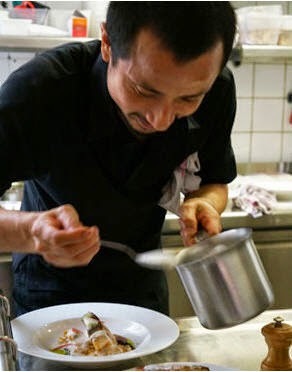 The staff seem to have their heart into it, and chef Dai appears to be genuinely interested in shooting for, as Mr. Steinberger concludes, 'homey, totally satisfying French cooking.' 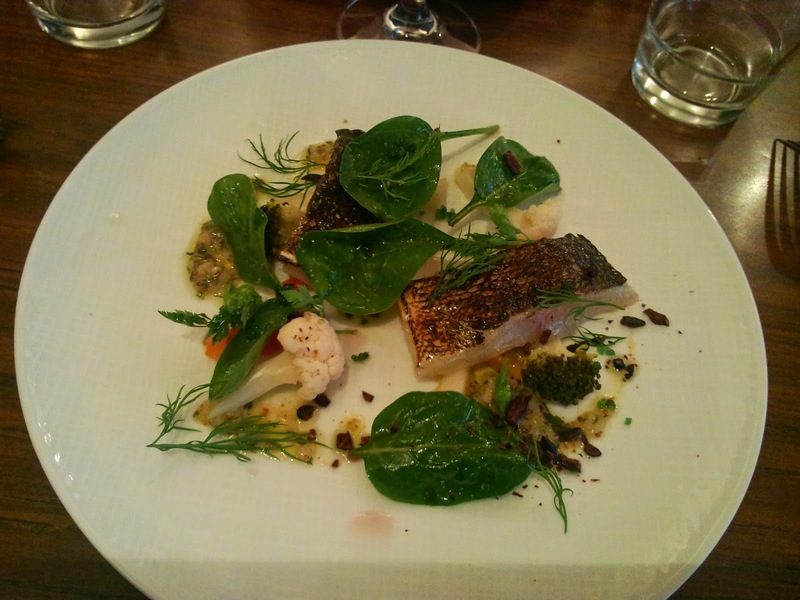 Is this one of the best new neobistrots in Paris, breaking new ground on the restaurant scene? Hell no. I can think of 20 venues off the top of my head that are more original. What's so special about a foreign chef in the kitchen, if there's little evidence of that chef's origins in the cooking? I don't get it. It must be nice to get a mention in the New York Times. About 20 years ago, I was quoted in an article, and my phone didn't stop ringing for two weeks. Get your restaurant mentioned there and you're in business. But it would be a shame if all that business consists solely of one-time tourist visits. Not the way to build a loyal clientele. Between a rock and a hard place, like our table. Two 3-course menus at 38€ a pop, plus a 30€ bottle of Saint-Nicolas de Bourgueil L'Hurluberlu - the bio wine - we were informed that it was a biologique wine only after drinking it) a big disappointment, flat, tasted precariously like grape juice = 106€, sans cafe. P.S. It would be nice to hear from readers, but if you don't speak French, maybe you don't realize how to participate. The way to comment on this blog is to look below each installment for the phrase 'Aucun commentaire'- (no comments) and click there. If there are comments, there will be a number in front of 'commentaire.' Please don't spam this blog with overly effusive praise ('this is one of the most informative sites on the Internet') along with a link to your Indian restaurant site. 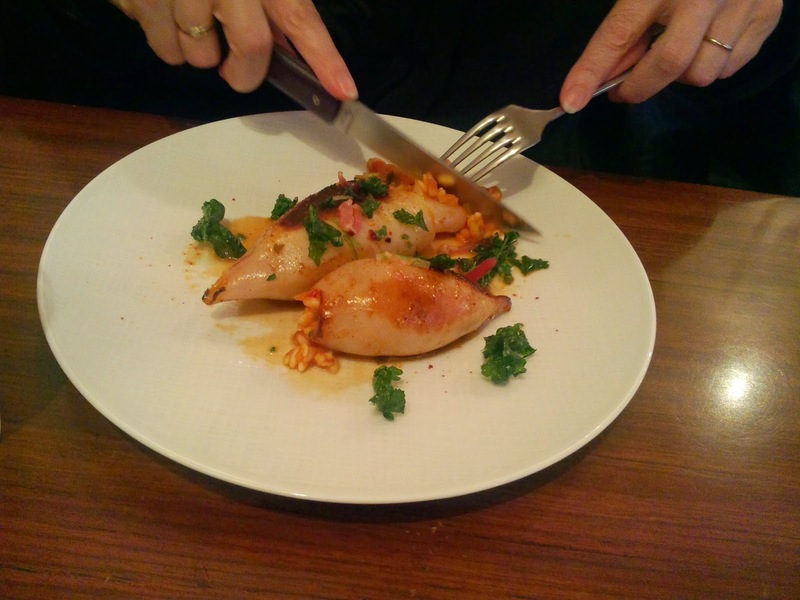 website: looks like they haven't updated the uninformative site that existed before the current owners took over Les Enfants Rouge wine bar - lazy.